healthcare that not only focuses on prevention and recovery, but also on reaching their greatest level of functional independence. Our vision is to prevent re-hospitalization and promote positive outcomes while you stay at home. 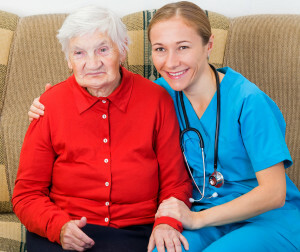 We provide specially trained and highly experienced nurses and therapists to care for you at home. Our specialty focused home healthcare multidisciplinary team will reduce hospital re-admissions. Why Real Solutions Home Health Care? Our on-call nurse clinicians answers all calls directly. Our patients will NEVER be placed on hold by an answering service. We are committed to exceeding the needs and expectations of our patients, physicians, and other caregivers by continuously reviewing for quality improvement in all aspects of our operation. We are committed to innovation as exemplified by our programs for CHF and Pneumonia readmission-prevention, as well as our post pacemaker/defibrillator and numerous other specialty programs. Our specialty care programs and highly experienced team of professionals are dedicated to helping patients achieve and maintain maximum independence for an improved quality of life. Real Solutions Home Health Care is accredited by the Accreditation Commission for Health Care (ACHC) which testifies to our higher standard of care compared to most other agencies.